Students pack Cuban Five forum in Washington, D.C.
On September 13, 2013, nearly 200 gathered in the University of District of Columbia David A. Clarke School of Law Moot Court Room for a panel discussion entitled "The Cuban Five: Justice or Injustice" that headlined actor/activist Danny Glover. Moderated by School of Law Professor Crisarla Houston, the panel included Gloria La Riva, Coordinator of the National Committee to Free the Cuban Five; Richard Klugh, trial and appellate attorney for the Five; Mara Verheyden-Hilliard, Executive Director of the Partnership for Civil Justice Fund; and Eugene Puryear, a Howard University undergraduate, author and activist. School of Law alumni director Joe Libertelli and law student Jino Ray made brief welcoming remarks. In attendance were numerous law students, law alumni, faculty and staff, as well as University Board Chair Elaine Crider, among others. 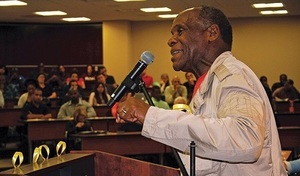 Mr. Glover spoke with eloquence and passion about the injustice of The Five's incarceration and of his own longstanding relationship with the men and his ongoing visits to them in prison. He exhorted those in attendance to join together to fight for justice and argued that the current halt to what appeared to be an impending war against Syria came about in large part as a result of people organizing and speaking out. Mara Verheyden-Hilliard, whose DC-based organization has been at the forefront of protecting protesters' civil liberties, described her organization's current successful federal Freedom of Information Act suit which is requiring the Justice Department to disgorge information about how the US paid Miami journalists to create a climate of hatred against Cuba and the defendants at the time of their trial. She also spoke highly of the commitment to justice of the UDC Law students with whom she has worked over the years and urged current students to participate in her organization's ongoing efforts on this case. Eugene Puryear, author of the newly published book "Shackled and Chained: the History of Mass-Incarceration in the United States" pointed out that the District of Columbia, thanks in part to the efforts of Mara Verheyden-Hilliard, is one of the places in the US where first amendment rights are most respected - and urged those in attendance to exercise those rights!